A carriage-themed baby shower is perfect for little ones who will soon be on the move, and there are lots of wonderful decorations that can complement this theme. From modern strollers to old-fashioned English prams, a baby carriage offers plenty of shower decorating inspiration. If you're hosting a shower, you have lots of options for making or buying baby carriage decorations. These ideas will help you get started. 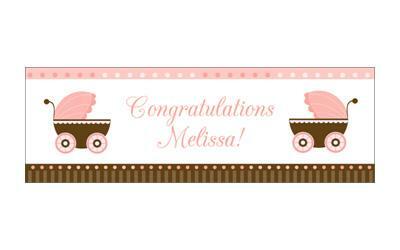 Neutral Baby Carriage Banner - This sweet banner from BabyShowerStuff.com can be personalized with the mom-to-be's name. It's available in standard and extra-large sizes and retails from $20 to $50. Baby Carriage Girl Banner - This soft pink banner from Ink Garden is a perfect decoration for a girl's baby shower. It's 72 by 24 inches and can be personalized with the mom's name. It retails for $25. Boy Baby Carriage Banner - This bright blue banner from BigDotofHappiness.com is a great choice for welcoming a little man. It comes in standard and extra-large size and retails for $20 to $50. 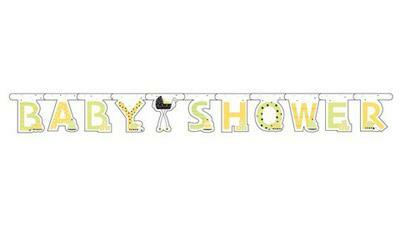 Stroller Fun Banner - In gender-neutral yellow and gray, this cute banner from Etsy would work for a boy or a girl. It retails for about $8. Lay the watermelon on its side. Cutting from the middle of the top and the middle of one end, remove about one quarter of the watermelon. Set this quarter aside. Use a melon baller to scoop out the watermelon flesh, and set this aside. Cut a scalloped pattern along the edges of the watermelon opening. Using toothpicks, attach orange or lemon slices to the sides of the watermelon to create wheels. Out of the remaining quarter of the watermelon, cut a handle for your baby stroller. Attach the handle to the carriage with toothpicks. Combine other fruit, such as strawberries and grapes, with the balled melon, and serve this in the baby carriage. An antique doll pram, often made of wicker or metal, makes a beautiful decoration for a vintage-style baby shower. You can find these old-fashioned doll carriages at antique shops, at flea markets, and at auctions. These miniature versions make adorable table centerpieces. Choose one that's in good shape without peeling paint or rust. 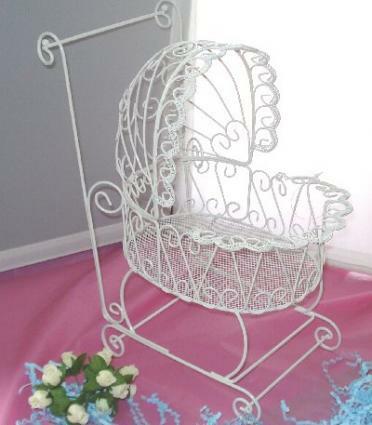 If you can't find an antique version or want a more modern option, consider buying one like the Lacy Wire Baby Carriage. After you've selected your vintage pram, fill it with potted flowers, a stuffed animal, or brightly wrapped gifts. Tie a bow on the handle, and allow the ribbon ends to trail gracefully. Place the doll pram on the cake table or the gift table to give your party a charming, vintage look. If you're in a hurry, you can also purchase pre-made miniature carriage centerpieces from stores like Etsy and Perfect Baby Shower. You can create an adorable decoration and a useful gift for the mom-to-be when you make a baby carriage diaper cake. This process is fairly easy. You'll need a large shoebox, two receiving blankets, a large package of newborn diapers, four burp cloths, ribbon, and lots of small baby toys. Roll four diapers together and tie them with ribbons. Repeat three more times to create four wheels for your carriage. Wrap the outside of the shoebox in a receiving blanket, using pins and tape to secure it to the box. Don't worry if the inside isn't covered, since you'll be filling that with baby items. Roll several diapers and place them in one end of the shoebox. Continue adding diapers to create the arched shape of the hood part of the stroller. When you're content with the shape, fold a second receiving blanket, and pin it in place covering the back and sides of the arched area and extending down under the shoebox. It's fine if the diapers show from the front. Place the shoebox on top of the rolled diaper "wheels." Line the shoebox with the burp cloths and fill the carriage with baby toys. Add some finishing touches with ribbons. There's no reason you have to stick with a standard flat table to hold the shower gifts. If you're throwing a carriage-themed shower, why not have an actual baby carriage to hold the gifts? 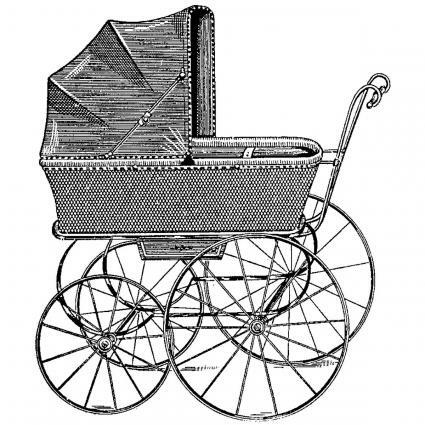 Vintage baby carriages are huge by today's standards, and they can hold a large number of shower gifts in style. To do this, buy or borrow an attractive vintage carriage. Decorate it with ribbons and flowers and place it in a central location at the party. As guests arrive, instruct them to place their gifts in the pram. When it's time to open presents, you can wheel the whole display over to the mom-to-be. You can combine a carriage-themed wall decoration and a guest book to create a beautiful gift for the mom-to-be. Use a carriage-shaped rubber stamp like the Hampton Art Diffusion Carriage Stamp to print an image of a baby carriage near the bottom of an 11 by 14 sheet of ivory cardstock. Frame the cardstock with a wide mat, and set the glass aside for later. When it's time for the shower, hang the carriage picture on a prominent wall where it will enhance your theme. Nearby, place several different colors of washable ink, as well as a few pens. When guests arrive, they can press their fingers into the ink and make fingerprint balloons above the carriage. Then they can sign their names on the wide mat. After everyone leaves, connect the balloon fingerprints to the stroller by drawing strings that tie to the handle. Add the glass back to the frame, and present it to the mom-to-be as a keepsake. Whether you decided to make or buy carriage-themed shower decorations, you'll find that this is a fun, classic theme. From centerpieces to wall decorations and banners, your guests and the mom-to-be will be thrilled with the creative and beautiful shower decorations you choose.